Worker shortage stories - PROTECT FARMWORKERS NOW! 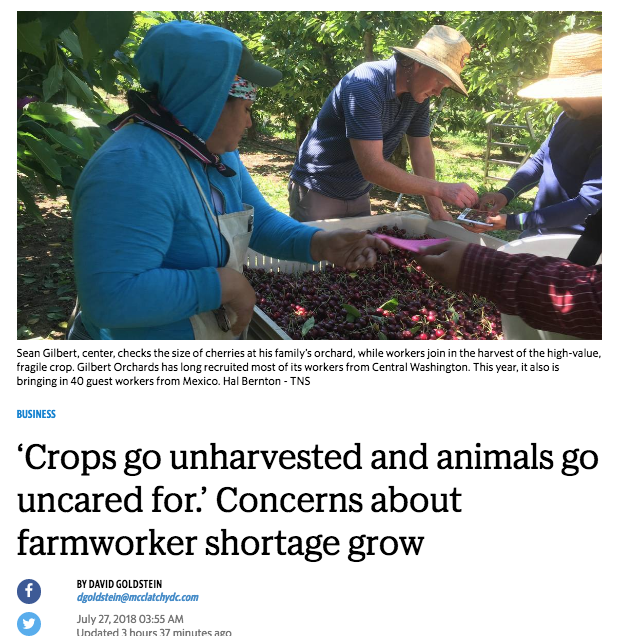 Major national news report from McClatchy was published in the Bellingham Herald on the critical shortage of farm workers. This article highlights the growing role of guest workers, the high cost of guest workers, and why the current guest worker program needs to change. As reported here, the farm worker shortage is affecting farming of various types including dairy farms. The guest worker program as it stands does not help this because of the limited time workers are allowed in the country. The LA Times reports on how much the worker shortage is causing wages to rise. Sounds like a good thing. The problem is that our farms are already paying 20 to 30 times what farms in Mexico, Serbia, Peru, Bulgaria, Chile and China are paying. Paying more sounds like it is good for workers. But more farms are going out of business, and the larger farmers who can are mechanizing as fast as they can to reduce labor. Fewer smaller farms depending on farm workers. Fewer jobs all around. With farms paying $20 an hour and more, with workers able to earn $35 and hour and more during the peak of harvest, how much would it have to go up to attract more non-hispanic domestic workers? Wouldn't farmers love to be able to pay $50 an hour and more? But, how do they then compete against those farms paying $11 per day, or less than that in some countries.